The Milly Autumn/Winter 2014-2015 Show, titled « DUSK », paid homage to the new ballerinas such as Maria Kochetkova, who, according to Michelle Smith, are the new style stars. Isadora Duncan’s lightness has inspired the Electric Feathers Autumn/Winter 2014-2015 Collection. Other Isadora Duncan-influenced collections : Ashley Paige Autumn/Winter 2008-2009, Calvin Klein Collection by Francisco Costa Spring/Summer 2006 (the dresses from this show paid homage to Isadora Duncan), Caroline Seikaly Couture Spring/Summer 2012 (« Isadora » collection), Diane von Furstenberg Spring/Summer 2011 (this show, titled « Goddess », which was named after Isadora Duncan, was inspired by the « Isadora Duncan (1877-1927) : A Living Sculpture / Une Sculpture Vivante » exhibition, presented at Paris’ Musée Bourdelle, from November 20, 2009 until March 15, 2010), Madeleine Vionnet Spring/Summer 2013 (to launch this demi-couture collection and to celebrate Madeleine Vionnet’s 100th anniversary, on September 30, 2012, in Paris, Alessandro Possati directed a film which was a tribute to Madeleine Vionnet and Isadora Duncan, who was Madeleine Vionnet’s muse in ’20s Paris), Missoni Spring/Summer 2010 (this show highlighted « new » Isadora Duncans), Prada Resort 2010 (partly). 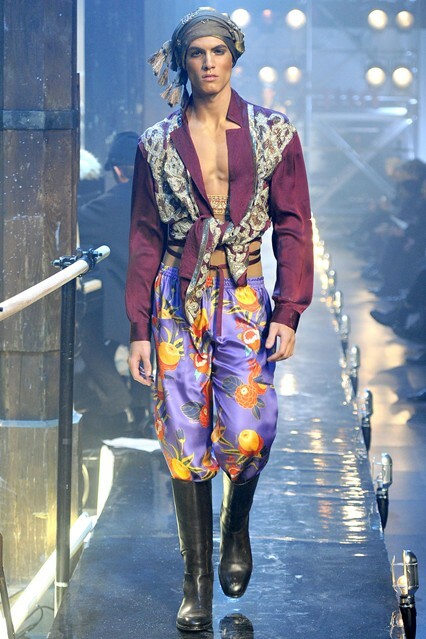 Rudolf Nureyev’s style influenced the John Galliano Autumn/Winter 2011-2012 Menswear Show. Other Rudolf Nureyev-inspired collections : Balmain by Olivier Rousteing Autumn/Winter 2012-2013 Menswear (Rudolf Nureyev’s style was mixed with the elegance of Russia’s Imperial Army officers), Carven by Guillaume Henry Resort 2013 (Peter Schlesinger’s photographs of ’70s icons such as Rudolf Nureyev have inspired this collection), Costume National Autumn/Winter 2005-2006 Menswear (the pieces such as caps, skinny trousers into boots, and scarves around the waist, evoked Rudolf Nureyev’s elegance), Jean Paul Gaultier Couture Autumn/Winter 2011-2012 (during this presentation, some men’s pieces were also showcased, which echoed Rudolf Nureyev’s iconic looks), Louis Vuitton by Marc Jacobs Autumn/Winter 2005-2006 Menswear (this show was partly based on Rudolf Nureyev), Roberto Cavalli Autumn/Winter 2005-2006 Menswear (the show notes mentioned Rudolf Nureyev). 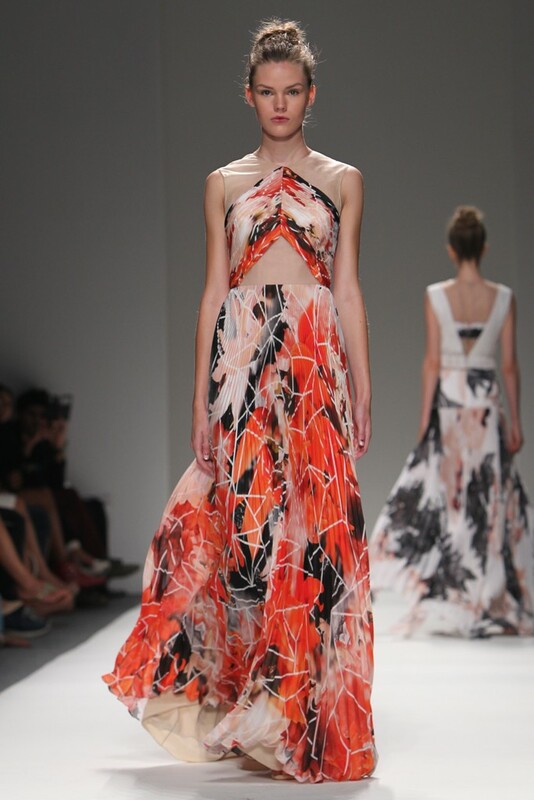 Wendy Whelan’s metamorphosis into a modern dancer influenced the Bibhu Mohapatra Spring/Summer 2014 Show. 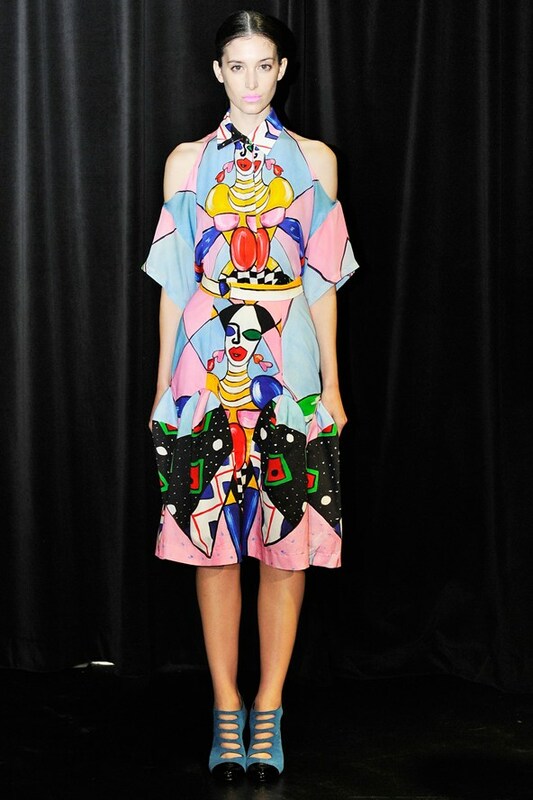 Sergei Diaghilev’s Ballets Russes influenced the artistic and graphic pieces of the Tata Naka Spring/Summer 2014 Collection. Another Sergei Diaghilev-inspired collection : MaxMara Resort 2014 (Sergei Diaghilev’s « The Rite of Spring » production was the starting point of this collection). To read about Ballets Russes-inspired collections, search for the « Ballets Russes » post that I published on January 14, 2012.